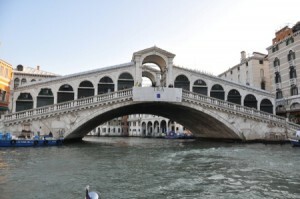 Parclick offers you some pointers on parking in Venice close to the Rialto Bridge. This is one of the must see places if you come to Venice: an inescapable tourist spot. Autorimessa Comunale AVM and Garage San Marco are very close: they’re in Piazzale Roma, close to Venice’s station, and the main entrance to the heart of the lagoon city. It takes a mere 15 minutes on foot to reach the Rialto Bridge from there, simply following the signs. The Rialto Bridge is one of the four important bridges in Venice, alongside Ponte dell'Accademia, the Ponte degli Scalzi and the Ponte della Costituzione. It crosses the Grand Canal and is one of the main attractions of the city: it’s signposted in every side-street of the lagoon. There are shops and boutiques of every sort near it, where you can buy any souvenir of Venice or typical Italian products. Besides on foot, the Rialto Bridge is reachable by boat, gondola, or by any of the water vessels that Venice offers its residents and visitors. Thanks to Parclick, you can book the parking space most suiting for your needs with just one click. Just select the parking icons on the map and choose the one most fitting your needs.